Happy Friday! We've made it. I'm one Friday (once this one is over) away from Spring Break. I have to admit, that Friday blog posts have been challenging lately since come the end of the week I am usually exhausted. I do my best to get ahead on the weekends but that comes with its own challenges. I've been working hard to make blog posts extra informative as of late and hope y'all have noticed this and it has proved to be helpful. Today's post is one that y'all have been requesting for a while now. I knew I wanted to take my time with it and make it thorough but that caused it to keep getting pushed off. Fortunately, after a couple of weeks sitting as a draft in my posts, it is finally complete. 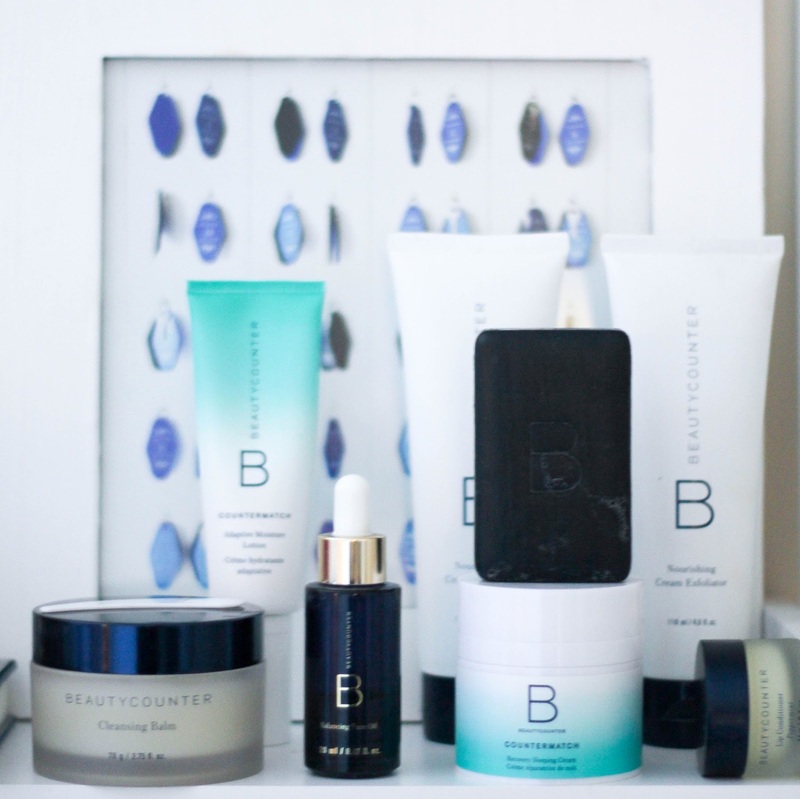 I shared with y'all a while ago why I chose to start making the switch to safer skincare products, specifically Beautycounter, and after that I've had tons of questions about which products are my favorite. If you haven't read that post I'd recommend starting there first (here's a link to it). For those of you that are up to speed on that, I did my best to only choose my favorite products that have become tried and true in my skincare routines. Since I have tried a number of their products, my favorites list is still pretty lengthy. All I can say is that once you try these products it's hard to go back. In an attempt to be more decisive with my favorites, I've put ** next to any favorites that I'm not sure I could do without. Many of the products fit into this category since I've already re-purchased a number of them but if you're new to Beautycounter then that is where I'd start. When sharing my favorites below, I've included the description of what the product does directly from Beautycounter's site as well as why I love it. I hope this helps you to see a little bit more about why I love these products and helps give you any suggestions if you're considering making a purchase. What the site says - Cleansing Balm melts into your skin to hydrate while it cleanses, removing makeup and other impurities but never stripping away moisture. With vitamin C to brighten the appearance of skin and raspberry and cranberry seed oils to hydrate, the formula can also be used as an intensely nourishing face mask. Bonus? You also get our reusable 100% muslin cloth, softer and easier on skin than a traditional washcloth. Why I love it - Amazing for taking off makeup. I put a bit on my hands before rubbing it in on my face and hopping in the shower. Makes for an easy all in one. What the site says - Soothe and nourish skin as you wash away makeup and other impurities with this ultra-gentle daily cleanser. Lightweight yet deeply moisturizing, the creamy formula contains witch hazel to tone skin, and coconut oil and aloe to help hydrate. Why I love it - This is my favorite face wash. A little goes a long way and it goes on really smooth. Highly recommend this and one bottle lasts a long time. What the site says - This gentle yet super-effective exfoliating cleanser sweeps away impurities to uncover fresh, radiant skin. Non-abrasive jojoba beads help slough off dry skin, while organic coconut oil and aloe soothe and hydrate. Why I love it - I alternate this with my nourishing cleanser when I feel the need to exfoliate. The beads in it are not abrasive but still help to feel like I am getting a deeper clean. What the site says - Our Charcoal Cleansing Bar detoxifies and absorbs impurities in your skin without drying it out, resulting in a smoother, brighter complexion. Made with antioxidant-rich, organic green tea and hydrating organic coconut oil, the gentle formula can be used daily on your face and body. Why I love it - After I use this, my face feels firm and smooth. Great to use after washing your face for an extra clean feeling. What the site says - No. 3 Balancing - Lightweight and silky smooth, our proprietary blend of seven natural oils moisturizes, smooths, and helps even skin tone. Softening meadowfoam seed oil restores balance, while wild chamomile calms and soothes skin. Perfect for all skin types and those concerned with skin clarity, calming, and balancing. Why I love it - I never knew how awesome face oils could be but they are really hydrating which I love. Beautycounter has them for different needs which is definitely worth reading into. What the site says - Skin at its peak performance. This lightweight lotion helps skin adapt to the ever-changing aggressors of modern life by adjusting hydration levels throughout the day for a smooth look and feel, and a radiant glow. Breakthrough Bio-Mimic Technology harnesses the unique life-giving properties of plants to exactly match the structure of skin, giving it precisely what it needs and nothing it doesn’t. Why I love it - I'm on my second tube of this lotion and have no intention of ever going without it. It really does make your skin look smoother and more even. What the site says - This advanced blend of hyaluronic acid, plum oil, and tara gum creates a protective layer to help shield skin from moisture loss, replenishing hydration and revitalizing skin while you sleep. Breakthrough Bio-Mimic Technology harnesses the unique life-giving properties of plants to match the composition of skin, giving it precisely what it needs and nothing it doesn't. Why I love it - This is a thicker version of the previously mentioned Countermatch Sleep Cream and is perfect to put on before bed. With my skin especially dry in the winter, hydrating overnight has become essential. What the site says - Pamper the delicate skin around your eyes with our lightweight, soothing eye cream. Rich in aloe and organic coconut oil, the unscented formula is easily absorbed and offers an instant cooling moisture boost. What the site says - Soothes and softens lips with peppermint and rosemary oils. What the site says - This nutrient-rich kaolin clay mask purifies and balances, absorbing excess oil and drawing out impurities. Activated charcoal minimizes the appearance of pores, giving skin a smooth, refined appearance while salicylic acid stimulates exfoliation. Perfect for all skin types and those concerned with congestion and oily skin. What the site says - This nutrient-rich mask instantly gives skin a brighter look and more even-toned complexion. Polishing kaolin clay deeply cleanses, leaving skin revitalized and renewed, while vitamin C helps reduce the appearance of dark spots. What the site says - Instantly absorbed and intensely moisturizing, this nourishing blend of 13 botanical oils leaves skin smooth, silky, and luminous, while hints of grapefruit, sweet orange, and rosemary create a beautifully complex yet subtle scent. What the site says - A luxurious all-purpose brush designed for dusting blush, bronzer, or finishing powder. What the site says - Created for use with liquid foundation and tinted moisturizer, this luxurious, travel-friendly, and dome-shaped brush creates flawless, even coverage. If you're thinking about making a number of purchases from Beautycounter, I'd highly recommend looking into becoming a Band of Beauty Member. By joining for $29 a year you get a free product, free shipping, 15% off all of your orders, and exclusive offers. This is perfect for anyone making the switch to safer skincare. I would love to hear what other types of posts you'd like to see or other questions you may have about Beautycounter or my skincare routine. I am thrilled for the spring since Beautycounter is releasing tons of new products that I am so eager to try out.